This high-end project by a famous designer required custom extracted Pure White Onyx, gem quality, which was mounted to tempered glass. Stone was recessed from the attachment edges, allowing for structural grip; we additionally assisted in detailing this product so it would pass building code for wet areas. 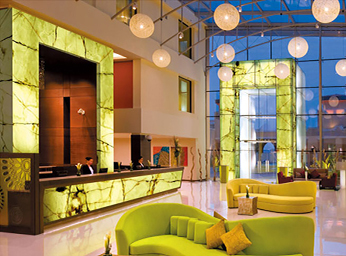 Premium Pakistani Green Onyx with striated veining was bonded to laminated glass to create a perfect backlit application for this prominent hotel lobby. As a focal point, this lobby is featured in several magazines and helped to support the brand reputation as a luxury establishment. 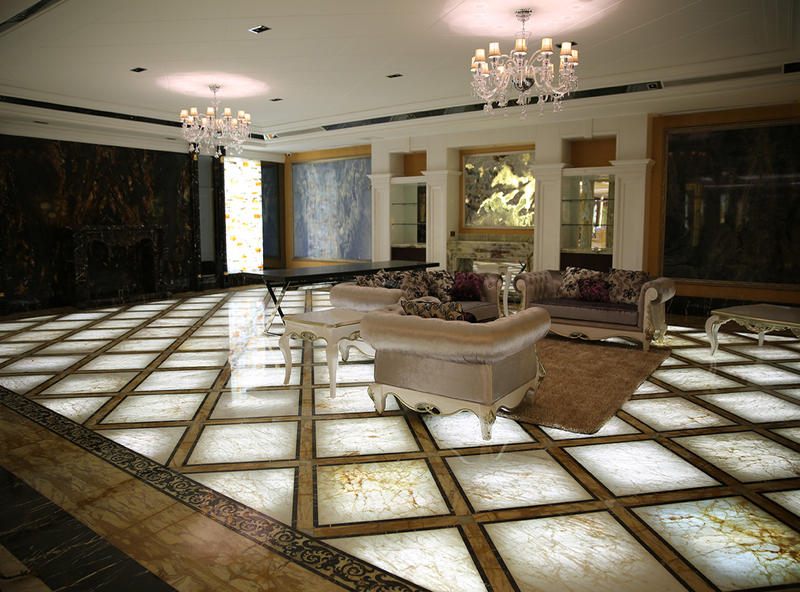 White Onyx bonded to structural glass created this backlit flooring application. The diamond shaped pattern was created with two different types of marble, which did not allow light to penetrate. This application created a look often desired and achievable with a raised floor, but was built over a recessed area for a premium effect. This international hospitality brand selected white onyx on laminated glass as a reception desk feature at one of their premier hotels. 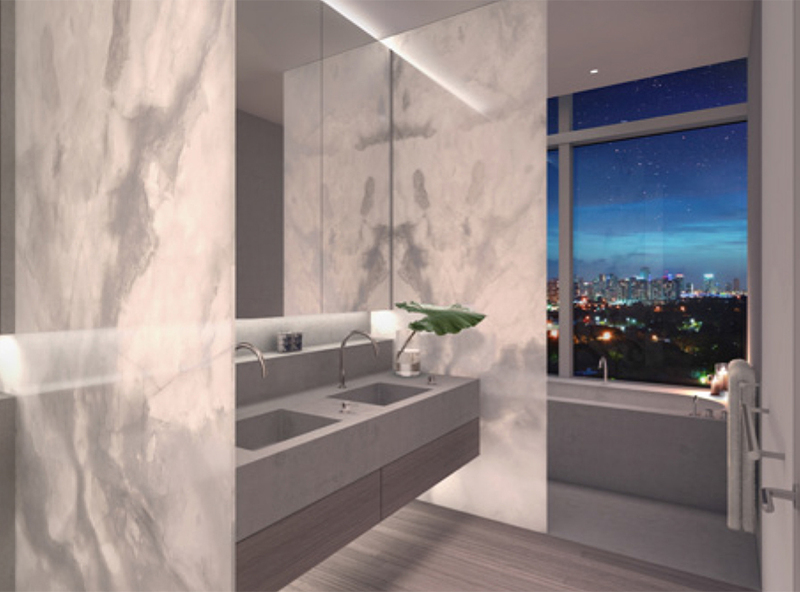 Although back-lighting was done at a lower budget, the glass structural backing to the onyx allowed for maximum lumen output, creating a luxury appearance. 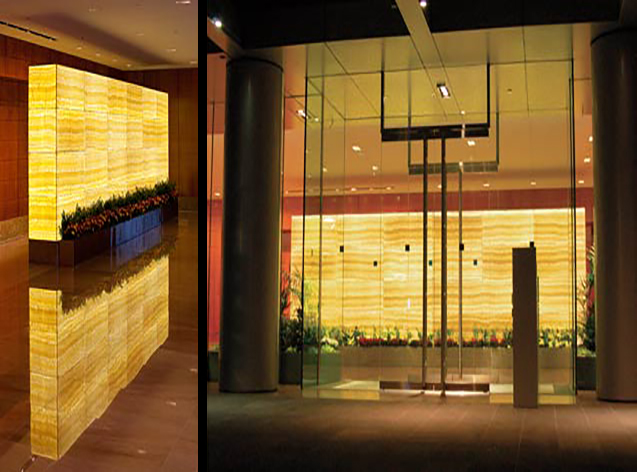 In front of a new glass entrance, this striated honey onyx was bonded to laminated glass, and clad in panels on all side, creating a light box feature visible from the street. Solid stone was used as a planter in front of and at the base to the feature, further adding to the dimension and functionality. 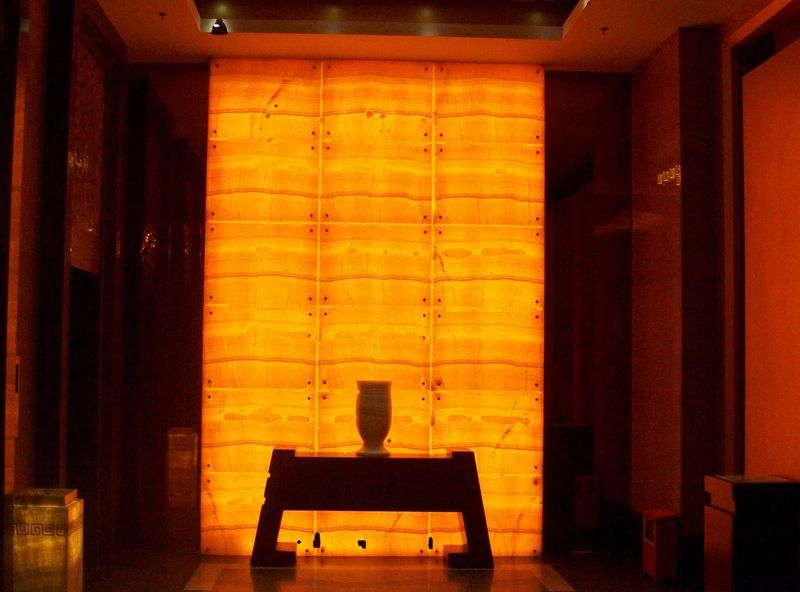 Although Orange Jade Onyx is offered, this customer chose the striated pattern of Honey Onyx, backlit by an orange LED lighting presentation, creating a warm, rich hue at their first three elevator entrance levels. 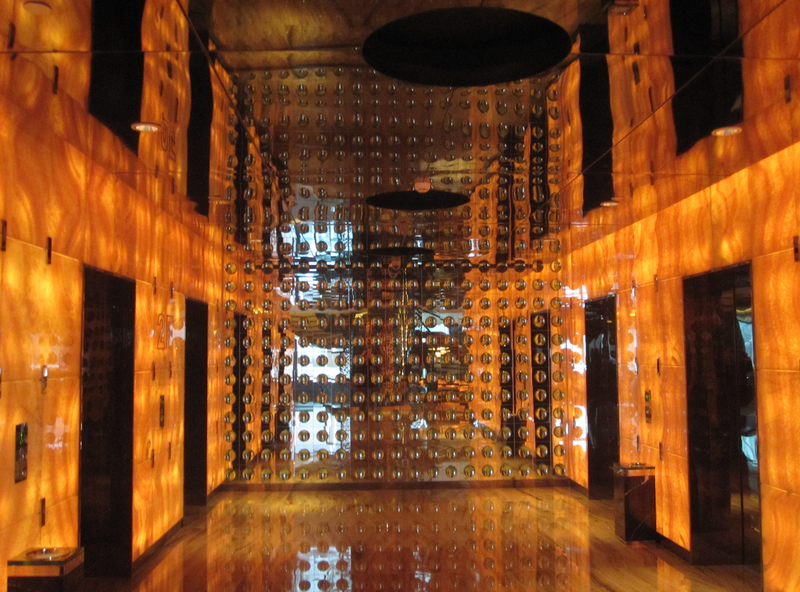 A mirrored back wall offered the ability for the onyx area to appear larger. 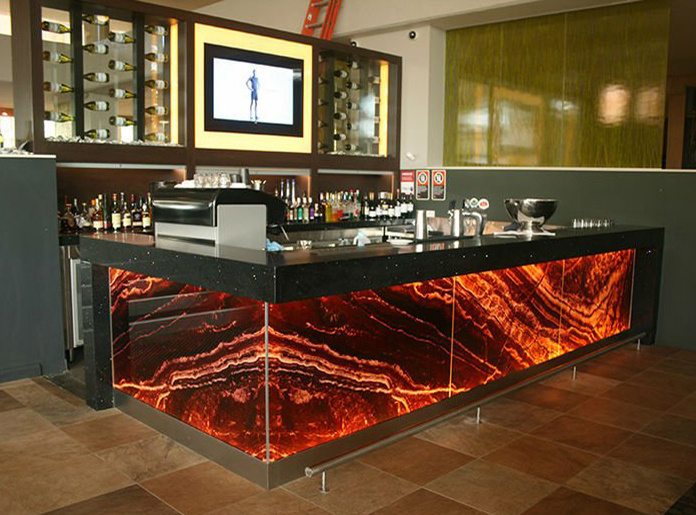 This unique Red Onyx took special stone selection to be the focal point of this hospitality bar area, which required book-matching to create a continuous vein pattern around the corner area of the bar. Considerable waste occurred to create this effect, but this was the customer's goal and was achieved perfectly. 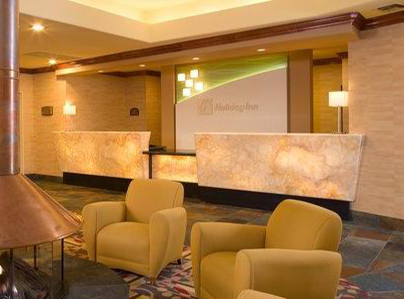 This lounge area feature is a unique and custom version of a honey onyx consisting of 4 pieces of onyx laminated to a single, oversized piece of laminated glass. The panels have a near invisible seam area in the pattern of a cross, allowing for continuous veining pattern to exist across the piece. 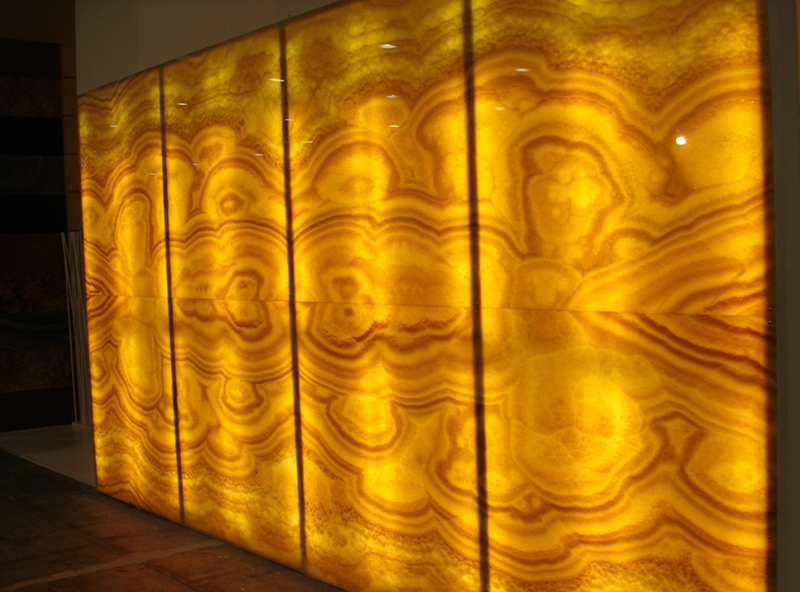 This Honey Onyx feature was backlit with amber light to create a warmer hue. Traditional framing was used to secure the panels, which were Honey Onyx bonded to tempered glass. Notice the placement of the panels to accentuate the darker vein section of the stone across several panels. While backlit this display is black and gold, during the day it is red and White. Amber lighting was used to transform this lounge area into a warmer hued space. Two oversized slabs mounted to tempered glass were book matched to create an unique art display. Pure White Onyx, gemstone quality, was used to create this luxury backlit display, featuring different colored LED lights to backlight the display. 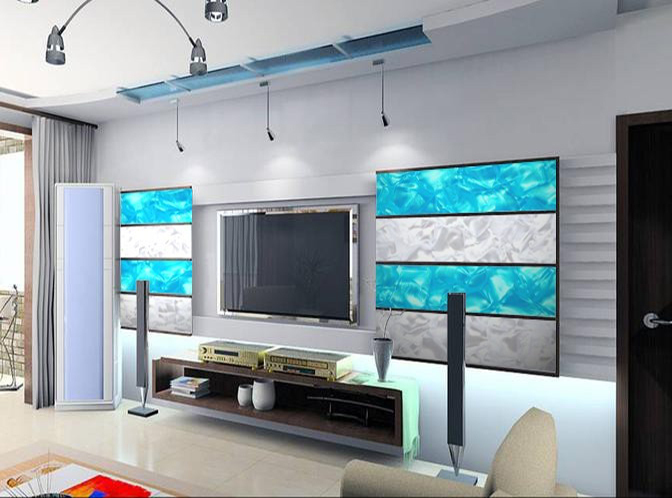 These lights changed color with remote control options to create a ever-changing light display. Pink Onyx was used to build this table that had more traditional lighting options within the center. This nightclub featured this table within its executive offices for the owner and executive staff to enjoy; the table was shipped fully built to the customer. 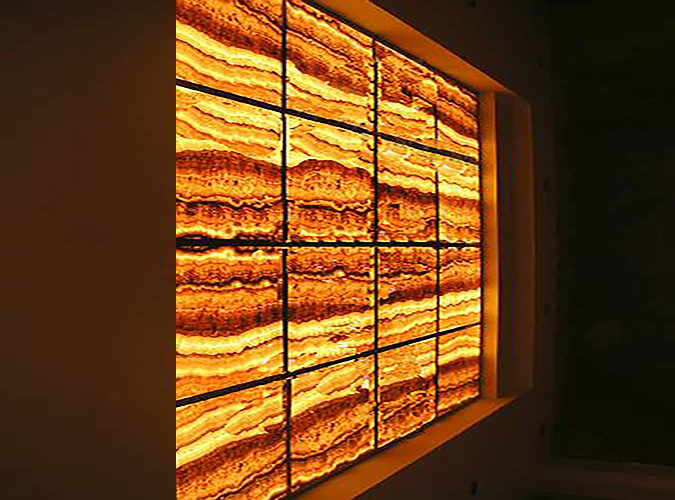 This art display featured two vertically book matched pieces of Honey Onyx on single panes of laminated glass, backlit by amber light. Careful attention was paid to the veining pattern to thoroughly disguise the book-match and separation of panes. Two oversized panes of glass featured a combination of Honey Onyx and Striated Red Onyx, both backlit by white light. Although it may be hard to see the red light up, it is due to the density of the stone, and therefore creates a negative in the lumen output. 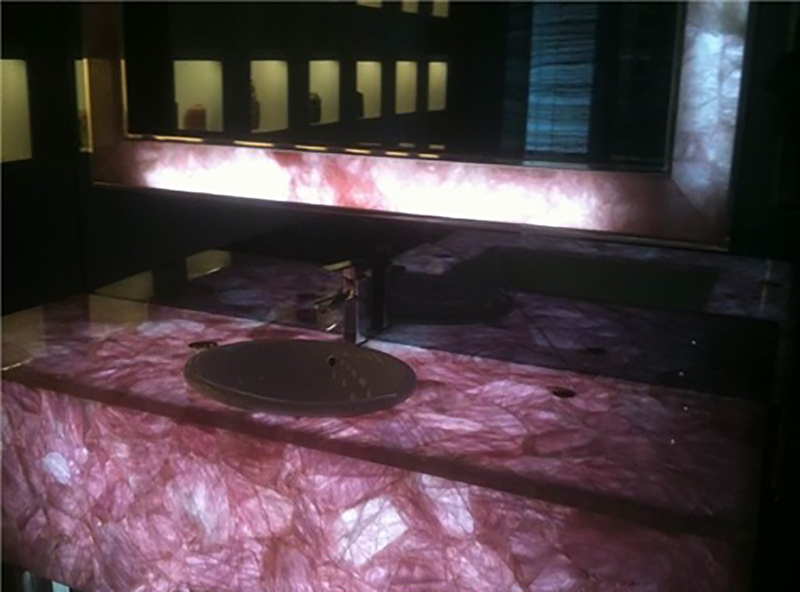 Semi-Precious Rose Quartz, bonded to laminated glass, is featured in this luxury vanity application as well as the mirror perimeter. All bonds were complete prior to the arrival onsite, as well as the hole for the vanity basin, which was chosen to be a drop in hand-painted porcelain. Small, continuous panels were used with predrilled holes for decorative kerf placement. 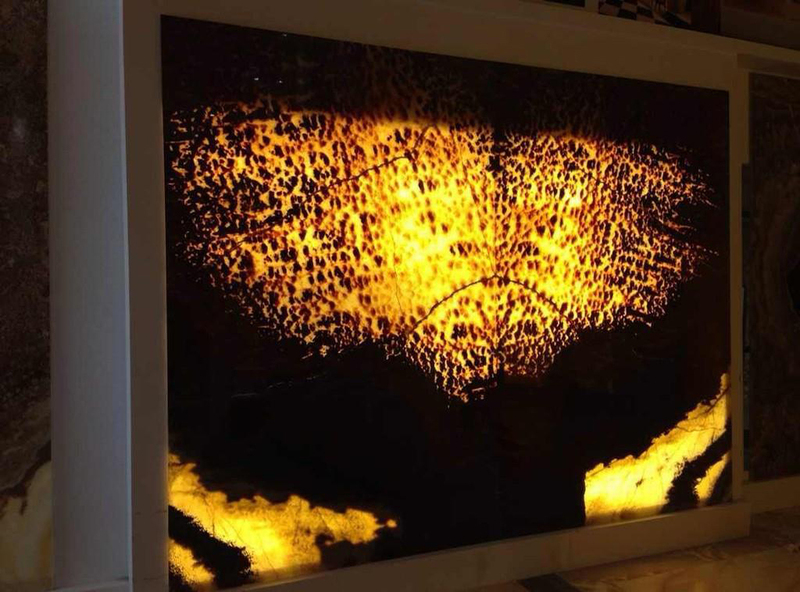 Striated Honey Onyx was chosen, bonded to laminate glass, and backlit using Amber toned LED lighting; framing was built in a traditional manner, making this an affordable display. These traditional White Onyx panels were laminated using tempered glass, and set into traditional framing, for an office back wall display. Limited size and mounting requirements made this an affordable display for an executive office. 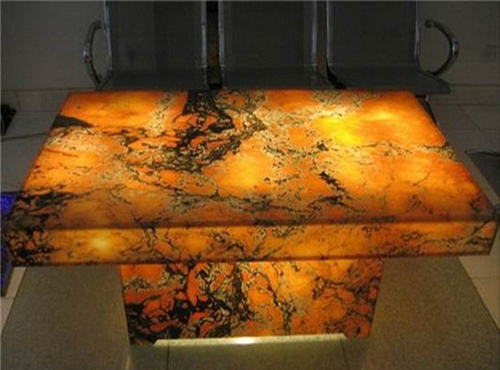 This reception desk featured Brown Onyx book matched on laminated glass, backlit, as well as front lit with halogen. The same onyx used for the desk area was also used for displays behind the desk, creating a warm and cozy feeling for this hospitality client. Onyx varies greatly even within the same block of stone so special attention is required for continuous and large displays. Each piece of onyx is said to be unique, with striated patterns offering the most consistency. The variance in onyx is said to be the intrinsic art value of the stone, but legends also say that the stone is so varied because it houses spirits within it. 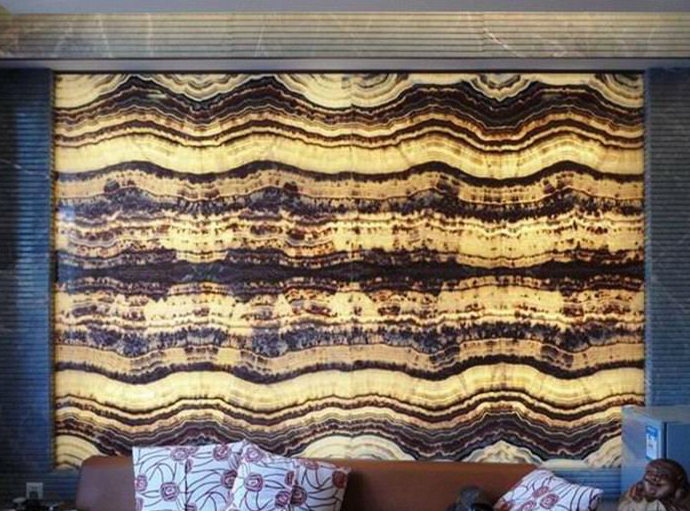 Onyx is used as art because of the unique patterns throughout, which can be creatively book matched or installed to create additional patterns and features that not only draw the eye, but can create a mood within the applications it is featured. 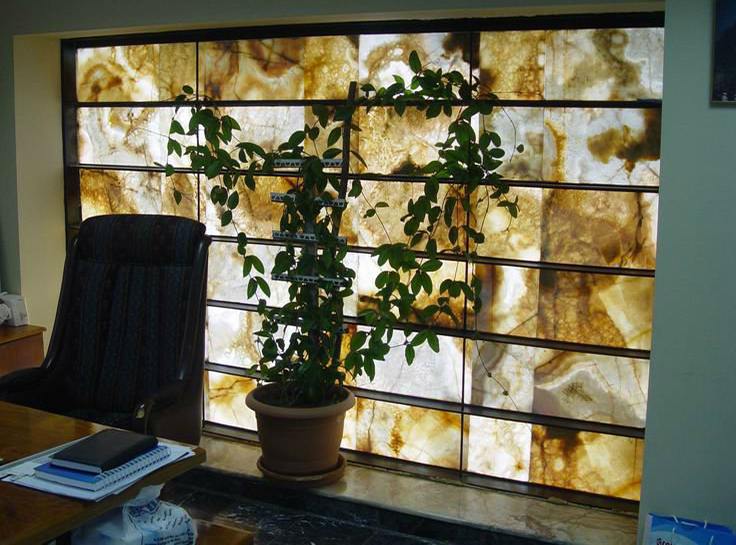 StoneSheets offers the ability to use multiple panes of onyx on single panes of glass to create these patterns, or as single slabs on single panes of glass, allowing the stone to speak for itself. Cloudy pattern onyx is the most varying throughout all the colors, with striated onyx allowing for the most consistent book-matching and designing for oversized pieces. Be prepared to require a little additional waste to allow us to create more elaborate patterns. Ask your StoneSheets Representative for assistance in designing and executing the ultimate look desired in applications! 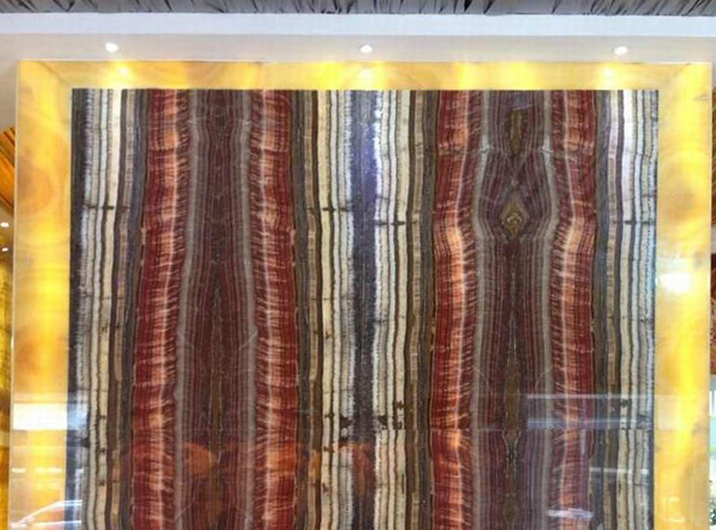 Because of the vast resources of StoneSheets Materials, we are often able to offer several unique and otherwise unknown onyx and semi-precious options that may not be listed here or under our stone offerings pages. Please be sure to check with your StoneSheets Representative to see if we are able to accommodate your most creative requests.